Don't let the size of your living space keep you from bringing home a pet that will bring you years of enjoyment. A cat condo is a multi-function piece of furniture that will keep your kitty happy without taking over your apartment. My friend recently downsized from a large farmhouse to a small apartment. She is debating on getting a kitten for several reasons one being she doesn't want an enormous cat tree in her small place. I explained to her that a big tower is not the only way to give her potential feline a variety of play and exercise options. A smaller piece of furniture like a cat condo can accomplish the same thing. A cat condo can vary in size and function. With a little shopping effort (don't forget about the internet), you can find that one perfect piece to give your pet something to play with, scratch on, hide under and sleep in -- all at under 10 inches high. That's all he needs in addition to a loving, attentive owner like you! Some people have concerns about odors and hair when they house a kitty in small living quarters. If you change the litter box often, not only will your kitten appreciate it, you'll greatly minimize the smell. You may also find an enclosed litter box helpful with that. And finally, choose your pet food wisely (you may need to experiment) as she will eventually eliminate what you feed her. Keeping pet hair to a minimum requires a two-pronged approach: regular vacuuming and brushing your cat. Many people swear by the robotic sweepers as you can turn them on and go. It also might keep kitty entertained for a bit as an added bonus! There are no robots to comb your feline friend but you won't want to give up that special time when you can show her you care. She will love the daily attention and you'll accomplish your ulterior motive of less hair all around. The bottom line is that if you want a cat, there are ways to deal with every issue. Don't let your living space (or lack thereof) keep you from bringing into your home a kitty that can bring you so much love. From a cat condo to regular brushing, there are easy solutions for you and your pet. As a long-time pet owner, Julie is passionate about supporting animal health and wellness. As a board member of her local rescue league, she understands the value proper mental and physical stimulation offers indoor cats in particular. Julie's Siamese cats, Sissy and Missy, enjoy the indoor life thanks to cat towers and cat trees from Ace Cat Furniture. 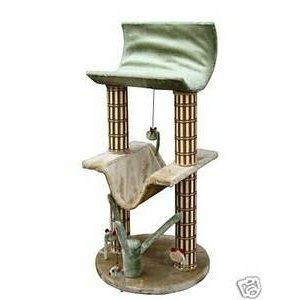 Wow Cat Condo Furniture That Will Last A Lifetime We often take the easy route and purchase cat furniture at the pet store only to find out that it does not last through many moves or cats, and often can not be repaired. Yes, constructing your own requires some basic tools that are not very expensive and you must be willing to do the work. Below is a step by step procedure for cat condo construction that will last a lifetime. Our estimated budget is set at $50-$75 range. Materials needed for a basic cat condo: 3/4 inch plywood you may have around the house or you can purchase at a lumbar yard. 3 pieces of 3' by 3', (top, bottom, upper piece), 4 pieces of 2' by 3', (sides of the base), 2 pieces of 2" by 4" by 8' pine or 1 piece of 4" by 4" by 8', (important notice you must double up the 2 by 4's or 4 by 4's if you desire a 5 or 6 foot condo), optional 4 medium to light duty rollers/wheels with bases, (to make the condo portable), 1 small box of number 8 galvanized nails, 1 small box of number 10 or 16 galvanized nails, 1 box of 9/16 staples for a staple gun, 16 wood screws 3/4 inch no thicker than the holes on the wheel base, wood glue, left over carpet or buy remnants from the carpet store. Tools: hand saw, hammer, staple gun, Phillips screwdriver, hand drill, carpet knife or box cutter, and jig saw or coping saw. 1. Build the base first with the pre cut plywood using glue and number 8 nails. I like to join the 4 pieces of 2' by 3' into a square first. Glue the ends and nail at least 4 nails per corner. Careful to match opposite sides as to how the lumber overlaps so you end up with a near perfect 3' by 3' square. At this point you have the option to notch out an entry door or several doors using the coping saw on the bottom edge so choose which is the top and bottom edges of the square you made and mark them so. 2. Half way on one side of one 3' by 3' plywood, cut out a 4 inch by 4 inch notch the do the same cut out on the opposite side. That will be the top of the base and the uncut 3' by 3' will be the bottom. Join the 3' by 3' pieces top and bottom to the sides. The bottom or base 3' by 3' will join with the doors you cut out. Don't worry about the sides being slightly shorter or longer because it will all be covered up with carpet. Key here is that the wood mates up enough to glue and again drive in at least 6 nails per side top and bottom. 3. This step you have to decide if you want a 4, 5, or 6 foot tall condo as noted above in the materials list. Caution, the taller the condo the more unstable it is with cats playing on the top deck so please do not go over 6 feet unless you plan to anchor it to a wall. Join side by side 2 of the 2" by 4" pieces to it is like a single 4" by 4" piece using glue and number 10 or 16 nails. Next take that piece and see if it fits down inside the box were you notched out the top. Notch more if necessary and remember blemishes will be covered up by carpet. Join the other 2" by 4" and check the other side. Now one at a time nail the 4" post to the bottom by laying the square on its side with the notch area pointing up and insert the 4" post then nail from the bottom base into the base of the 4" post with at least 3 of the number 10 or 16 gauge nails. Next, nail from the side of the 2 by 3 into the 4" post with at least 3 or 4 of the number 10 or 16 nails. 4. Now you can start cutting pieces of carpet. I like to cut for the sides of the base first allowing overlap the bottom 3' by 3' glue and staple in place with the staple gun. If some of the staples are visible the use the hammer to pound them in further. Use your carpet knife to remove carpet where the doors are then stable the carpet around the door. Next cover the top and trim around the 4 by 4 posts, and staple. Leave the posts bare for now. 5. With the last 3' by 3' piece cut out a 5 or 6 inch circle in the center using a coping saw then attach it to the posts with glue and at least 3 number 10 or 16 gauge nails. Now you can carpet the posts and top perch, (both sides please on the perch), and cut out the carpet to open up the hole/door to the perch. Staple around both sides of the door as well as all edges. On the posts I like to finish attaching carpet with number 8 nails at least on two sides but all four is best. Nail about 4 nails 10 inches apart on all four sides. 6. Lay the cat condo on it's side and attach the wheels, (optional), near each corner. First use a pencil and trace out where the screw holes are and darken that area with the pencil. Next use a drill bit that is at least half the diameter of the screw you will use and drill where the pencil marks are. Simplest way to attach wheels, I like to do just 2 opposite holes and then screw on the wheel to the base. Finish out the other screw locations after the wheel is mounted. Looking For Cat Condo Trees? Cat condo trees Looking For Cat Condo Trees? can give your bed and furniture a break from fur and scratch marks. A cat condo is a special place all your cat's own, a hide away from the kids, a private and quiet bed, and in many cases, an activity center to keep them entertained while you're away. They come in a variety of different shapes and sizes, from a single covered bed area, to a multi-tiered combination of hide away places, platforms, and play toys the go all the way to the ceiling. Some of these are so elaborate they can even resemble real trees, with fake bark and leaves. These have trunks that are completely enclosed with just a few openings for your cat/s to peak out of, and high platforms where you can can concealed by fake foliage. Of course these are extremely expensive, running from $400 to well over $1,500. Luckily, cat condo trees don't have to be that expensive. Many cat condo styles run about fifty dollars, even ones that have multiple platforms and spaces for sleeping. Even ones that are quite extensive, with many tiers, as tall as the ceiling with run you just a few hundreds of dollars, but they are well worth it. There are many different advantages of having one of these trees for you pets. Cat condo trees usually have at least one post that has tightly woven rope wrapped around it. Trained at an early age, or coated with catnip a few times, these areas of the cat condo will be used as a scratching post, instead of your furniture. The more the get used to sleeping in the condo part, the less cat hair you will have all over the house. These creations can also be a good way for and indoor cat to get exercise, and have things to do while you're at work. When you get goes crazy one the tree, playing with the hanging toys, chasing their companion up and down the platforms, they can provide owners with entertainment as well. There are some things that you need to know when buying your cat condo trees. One of them is to make sure the bottom platform is wide and heavy, in order to keep stable while your cat is playing on it. The whole thing should also be made of wood or other sturdy material, to support the weight of your pets, and to stand up against wear and tear. The platforms, condo spaces, and other hang out areas should be covered in carpet, so your cats will have something to grip when they are jumping around, and be cozy in their hiding space. At least one of the trunk parts of the tree should have the rope wrapped around it, and in many cases, all of them will. If you are planning to buy a ceiling high model, make sure you secure it well, so it doesn't accidentally tip over from regular play. Some places to buy your cat condo trees or cat condo by itself is from you local pet supply store. They will have an abundance of different models and styles to choose from. Now before you buy from a local store, which may be convenient, it is still a good idea to check online to compare prices. The difference is going to be that buying online will mean having to pay shipping, as well as the possibility of putting it together yourself. 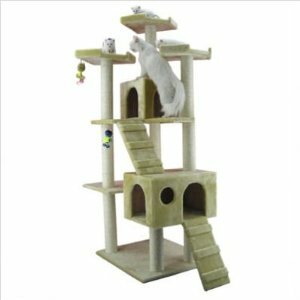 cat condos help cats get in their natural instincts to climb trees. Cats climb for many different reasons. Since many cats in the wild use the trees to hide from larger predators, or to leap down on their prey, a cat condo can be a great substitute and help fulfill their needs. There are many different types and sizes for these products, from simple single story hideaways to large floor to ceiling models with an abundance of climbing, perching and hiding places. Because of the way cats are made, having kitty cat condos can provide many necessary things that a cat needs. 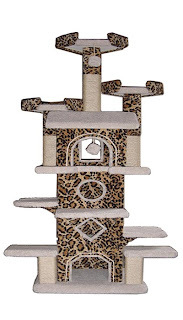 They have powerful back legs that are just made for jumping and climbing, so a cat condo can help them with exercise. Some indoor cats don't have the opportunity to get out and climb a real tree. Cats not only need to climb and jump, but they also need a safe place where they can scratch. Scratching not only helps to clean their claws, but also to get old claw coverings off. If you own a cat, then you know the importance of having a special place for you cat to scratch, because if they don't, then you will end up with shredded furniture. Others use trees to mark their territory, and having cat condos can save your furniture from being sprayed. Because cats love to climb, jump and scratch, having kitty cat condos can save you money in the long run, from not having to replace your valuable chairs or sofa, as well as keeping them from jumping up on your shelves or book cases and knocking your precious nick knacks over. Because there are so many different cat condo products available the choices can often be a little overwhelming, but here are a few tips to help you find one that your cat will just love. One of the first things you should look for in kitty condos is a scratching area. Usually any vertical post will have some kind of tight rope wrapped around it. This provides the rough surface that will help them trim their claws naturally. All too often people buy those pet clippers, which if not used properly can permanently injure your pet's claws. 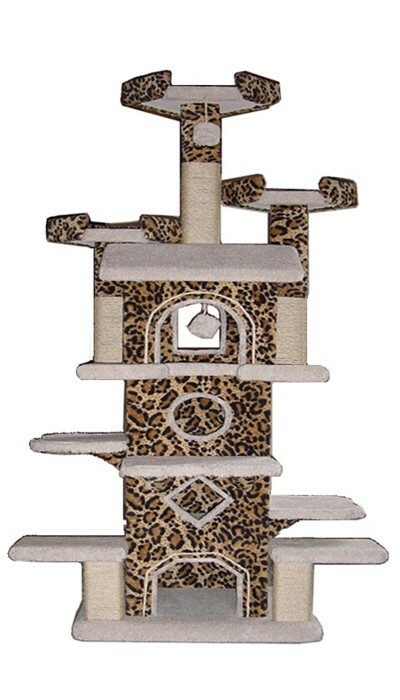 You want the scratching post part to be high enough so that your cat can stand on its hind legs to really get into it. The next thing you need in a cat condo is at least one area that is enclosed so your cat can climb in and hide. You can even put a piece of cloth or a small blanket inside it, because you may find your cat curled up asleep in it. This too is because of their natural instincts to use trees for a hiding spot from larger predators. In this case, they may use this spot to hide out from other cats, or from pestering children. They should also have platforms that are large enough for your cat to sit comfortably on, set at different heights and angles so your cat can jump or climb up on them and perch. Your cat condo should also have hanging toys to keep your cats entertained. Now the big thing about kitty cat condos is a stable base. You want the base of your cat condo to be large and stable, so that even if your cats are playing hard on it, it doesn't fall over. Some taller models have a bracket so they can be attached to the ceiling so they don't tip over. You will also want your condo to have some kind of covering, like carpet, so that when your cats are climbing or jumping they have a surface they can grip into, just like the bark of real trees. cat condo a quick look Online will reveal a range of different types of cat condo furniture. While there are many different options to invest in, not every piece of furniture is worth your investment. Here are a few tips to choosing the very best furniture for your pet. *Choose furniture that is designed to last. If you go with the cheap, plastic cat products on the market, they will last perhaps as long as it takes you to build them. They are easily torn apart by the average cat. Instead, choose cat condo furniture that is strong and durable. Some of the best have steel frames, which not only add to the durability, but also to the stylish look of them. *Look at the design of the furniture. Is it fitting to your cat's interest? It should have someplace your feline can scratch, such as a foam padding. It should have a nice place for your pet to nap. Cats love dark, small spaces where they can hide out and sleep well. What about a perch, or a way to get up high in the room so that they can look down on their surroundings? When choosing cat condo furniture, choose something that gives your cat plenty to do no matter what type of mood they are in. *Your home does not have to suffer! When buying this type of furniture, keep in mind that it should become a part of your home. In other words, it has to look great as part of your home's furniture, as well as be a fun place for your pet. You can accomplish this in various ways. Choose cat condo furniture that is stylish, or even that matches your home's décor. This may sound like a big wish list but the fact is, there are many fantastic options to select from that meet these qualifications. Cat condo furniture should be a process that is much like buying other furniture in your home. What works for your pet's needs? The good news is that it can be a lot of fun to check out the options available. Many pet owners love making these additions to their homes since they are affordable and rewarding to their pet. Cat Condo Feline condo designs range from ultra modern structures to ones made to resemble trees and waterfalls to elaborate castles complete with towers and turrets. When selecting a Cat Condo for your cat, it is important that you not only keep in mind how the Cat Condo is built, and looks, but also at the features that it has to offer to your cat. 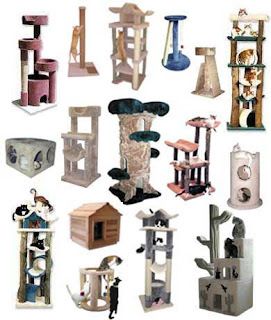 Cat condos are also made from a multitude of different materials that as a potential buyer you need to carefully examine. 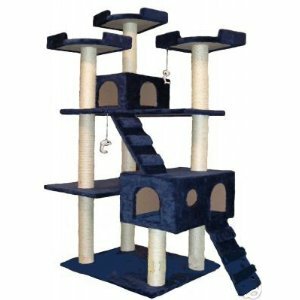 If you want your cat condo to double as a scratching post it is important that you make certain that the material provided for scratching is going to appeal to your Cat Condo. Cats are very particular about where they scratch, hence their preference for the most expensive piece of furniture in the house. They like a surface that is thick enough to get their claws into but that will have some give to it. One of the best materials for this is sisal rope. Many cat condo offer areas where they use different colors of sisal rope to allow the cat a place to clean and sharpen his claws. Sleeping areas on the condo are often made out of different fabrics to offer your pet a softer more relaxing area. Some condos use faux fur while others stick to the more traditional carpet like material. One of the most important things to look at when buying a condo for your cat is what is under the material. You want to ensure that the condo has a good heavy base and will not tip or fall over. If a condo is not stable, your pet will not use it. Moreover, and obviously for the safety of your feline friend, you want to make certain that he will not be injured in a vigorous play session due to poor construction. A cat condo is truly a great way of enriching the life of your pet. A cat that is indoors all the time will especially appreciate having his own space and play center.